Nordic athlete Michael Ward was in Lake Placid, New York recently, where he was in the middle of competing in the U.S. Nordic Combined Nationals. "It’s definitely one of the biggest competitions of the year besides the Olympics. It helps rank the team and the result will help you get to Sochi," Ward says. Nationals were held in mid-October and we’ll tell you how he did later. First, Michael took to skis at the tender age of two helped by his Olympian father, Craig Ward. 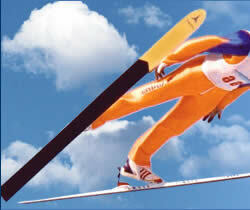 By age six, he was training with the local ski club and by nine, he was not just Nordic skiing, but ski jumping. He was influenced by friends and mentors from Aspen like fellow Nordic skiers Simi Hamilton and Noah Hoffman. "When you’re young, everyone wants to be a superstar athlete and when I started cross-country skiing, I was able to look up to Noah and Simi and they helped me realize I can actually have a career out of it." Now, he says he’s totally focused, training twice a day, every day of the year and working hard to improve part of his specialty: ski jumping. "It all happens within a split-second where we have to go from a tucked position into our flight and if you don’t execute that correctly, it’s the difference between a 120 meter jump and a 60 meter jump," he says. Michael’s event is called Nordic Combined. In it, athletes first jump and then race. For the ski jump portion, judges look for style and distance. Jumpers can fly up to 125 meters, or 410 feet. 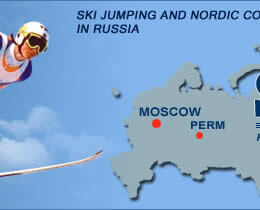 The jump determines where the athlete starts in the following 10k Nordic race. For example, if a jumper is 15 points ahead in jumping, they get a 1-minute head start in the race. In a video from the 2010 Winter Olympics in Vancouver, ski jumpers are launching down a snow course on long, wide skis. 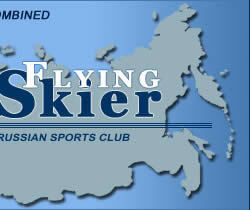 They hit the jump and fly with their bodies stretched forward, over the skis. It was this competition where the U.S. Nordic combined team made history. The four-man team took silver. And, it was the first medal ever for the United States in a Nordic combined team event. Now, Michael Ward and his teammates hope to duplicate their predecessors’ success. The United States Ski and Snowboard Association says Ward is part of a rising contingent of athletes who represent the future of Nordic combined in America. 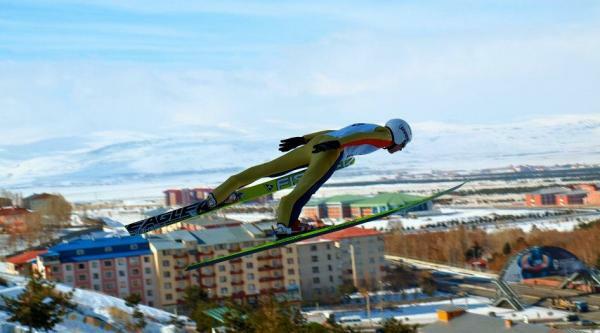 "The U.S. is very competitive in the international nordic combined," says Craig Ward. Michael’s dad has watched the sport evolve over the years from when he competed in the Olympics in the 1980’s. "Our U.S. team is very strong, it’s probably one of the top four teams in the world. So, for Michael to be doing well and getting close to those guys is a very good sign." He thinks his son’s got a good shot at making one of five spots on the Nordic combined Olympic team. Craig Ward coached his son when he was younger and now he and his wife attend many of his competitions. "I get just as excited for him as I did when I was racing. I’ve been out on the cross country courses, yelling and screaming my head off. I’m just so thrilled that he’s there and that he’s doing well," he says. Back at Lake Placid, Michael placed 9th overall in the Nationals competition. There’s still room for improvement though before the Olympic committee makes its selection early in the year. Michael says he’s hopeful. "Currently, I’m the fifth ranked athlete on the team, so, fingers crossed, but I still have some work ahead of me."